Babiak has a knack for grabbing the reader from the outset. Come Barbarians opens with a horrific tragedy. Kruse’s daughter Lilly is killed crossing the street by an apparent drunk driver. The driver, a local baker and a rising star in the right-wing National Front Party, and his wife are soon found viciously murdered. Kruse’s wife, Evelyn, is missing and becomes the chief suspect in their murder. 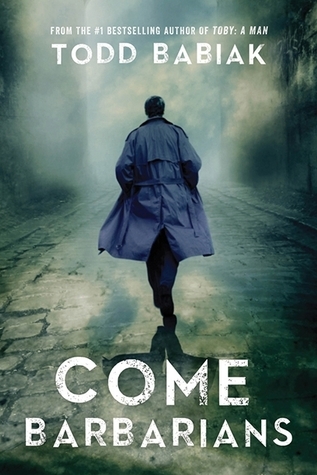 Ironically, Kruse, who has come to France to put his violent past behind him and save his marriage to his academic wife, will need those skills to find his wife, who is not only pursued by the authorities but also by Russian thugs and an organized crime family who may or may not be linked to the National Front. This ruthless Corsican family will do anything to conceal what happened the night of Lilly’s death. Similarly in Son of France, a grenade attack occurs in a Jewish cafe in the Marais neighbourhood of Paris killing, among others, a rising popular politician. This attack will remind readers of events in Paris last November but the scene is based on a vicious assault that actually happened in 1982 at a Jewish restaurant. Kruse is hired by an alluring woman in French intelligence to find and destroy those responsible. 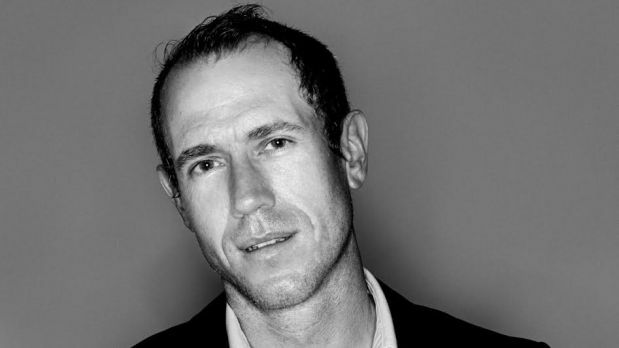 In both novels, Babiak depicts a few grisly torture scenes that will keep readers riveted. Throughout, the political and personal layers are equally engaging. Babiak has made an astute decision to set both novels in the early 1990s around the time of the Maastricht Treaty (formally, the Treaty on European Union or TEU undertaken to integrate Europe was signed in Maastricht, Holland). The treaty is referenced in the second novel, but Kruse, probably like most Canadians, has no awareness of it and the visceral emotions it evoked among those opposed to it. In a memorable scene from Son of France, Kruse experiences those feelings when he attends the birthday party of one of Lorraine’s most powerful regional aristocrats, a sinister figure surrounded by menacing bodyguards, who is enraged by the treaty that allows foreign competition to threaten his financial and social status and he will do whatever it takes to maintain his privileged position. InCome Barbarians, Kruse encounters a powerful figure in the National Front who nostalgically evokes a land of "bicycles, baguettes and berets," a Frenchness that is being leeched away due to the growing number of Moroccans who pollute the French soil. In both novels, we are reminded of the Vichy regime of the war years and how the extent of their collaboration with the Germans among the French, plays itself out in the 1990s through the attraction of the National Front Party. Babiak’s allusion in Son of France to the 1993 World Trade Center bombing in New York City that killed six people and injured more than a thousand is his linkage to the assault in the French café as suspicion falls upon an Islamist leader. Along with his mentor Tzvi, a former operative of Mossad, to whom we were introduced in Come Barbarians through a series of flashbacks when both lived in Toronto, Kruse sets out to track down and kill this terrorist. But confronted with certain evidence, Kruse questions whether this man, who has undoubtedly committed terrible crimes, is responsible for the café massacre. Likewise, are other political suspects that we encounter throughout the novel responsible or are they red herrings designed to deceive? Is Kruse being manipulated? 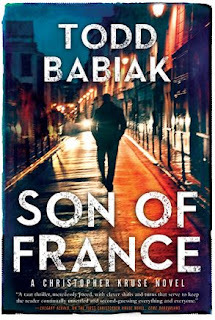 Reading the second novel, I was reminded of the French writer, Michel Houellebecq, whose novel Submission posits the idea that with the unpopularity of the Socialists and the weakening of the centre-right parties, the Presidential runoff is between the candidate for the National Front Party and a charismatic pragmatic Islamist leader. The latter becomes President and Houellebecq imagines the gradual Islamism of the universities and society in general. I have no idea whether Babiak has read Submission but I think he plays with a variation on this idea. He must have mused: what other methods can be deployed to blunt the popularity of the National Front and who would wield that power? Suffice to say that politics fuels the plot’s trajectory in Come Barbarians while politics serves to camouflage the need for personal revenge in its sequel but in ways that are surprising and unpredictable. Through the character of Christopher Kruse, the personal is also at the heart of both novels. We learn early that Kruse comes from a Mennonite background and that his parents died in an accident when he was a teenager. Although he has rejected their pacifist theology, he still retains in his psyche a lingering respect for it, something that can be dangerous for a security expert. In the previous paragraph, I alluded to Tzvi and Kruse’s ability to locate an Islamist terrorist, but he is not alone. Whereas Tzvi has no ethical problem in eliminating bad people even if there is collateral damage, Kruse hesitates, a decision that he regrets because his gesture of compassion leads to a torture. His compassion extends to a woman and her young daughter since their lives are at risk in Come Barbarians after the journalist received a phone contact from Evelyn wanting to tell her story and correct the official version. Kruse shows great resourcefulness and courage in trying to save and ensure their protection, even as he puts his life in danger. Kruse’s sensitive and kind relationship with the young girl is an echo of how he was with his own daughter, Lilly, abundantly evident from several flashbacks that show him to be the primary caregiver. One final thought about the power of the personal in his crime thrillers: When he was about to submit his final manuscript for Son of France, he received a telephone call from his brother informing him that his girlfriend had been murdered, a tragedy that he has written about and has spoken about on the CBC. As of this writing, no suspects have been apprehended and according to Babiak, no words can console his brother. We do not know how this terrible crime will affect his writing, but from his column and interview, it is clear that it will. The only hint that he provides is his comment that a violent death has awful ramifications for many others, including those who commit violence, because of the toxic stain that can never be eradicated. He sounds like Kruse’s Mennonite parents. I await Babiak’s next novel.